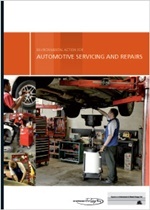 This guide is designed to provide auto repairers with valuable information on improving their environmental performance. It also demonstrates how they can save money, improve staff retention and their bottom line as well as reduce risks and avoid penalties. The guide summarises the NSW environmental law that applies to this industry and provides practical ‘How to’ information for each key environmental issue. It provides clear solutions for dealing with air emissions, hazardous waste, noise and water pollution with case studies and contacts for further information. The Self-assessment Checklist and Environmental Action Plan assist with evaluating performance and identifying areas for improvement.